It was an unexpected day in Group D action at the World Cup as Costa Rica pulled off the shocking upset of Uruguay. Costa Rica was widely considered to be one of the weakest teams heading into the 2014 World Cup. As a matter of fact, many betting sites were offering odds as to whether Costa Rica would score a single goal in the competition. Uruguay, despite not having the services of striker Luis Suarez, was considered the clear favourite to beat Costa Rica today. The general line of thinking was that Italy, Uruguay and England would be battling it out for the top two spots in the group, while Costa Rica would lag far behind. Things started off as expected in the Costa Rica/Uruguay match after Edinson Cavani scored a penalty in the 24th minute. Sure, Uruguay wasn't looking particularly sharp, but they were still expected to pull through with the victory. In the second half of the contest, Costa Rica started to click and the wheels fell off completely for Uruguay. Joel Campbell tied the game in the 54th minute and Oscar Duarte got Costa Rica the lead a few minutes later. Marco Urena iced the game for Costa Rica in the 84th minute, much to the delight of the people of Costa Rica. Uruguay left the pitch with their heads in their hands, shocked by what had transpired. Italy managed to grit their teeth and bare down through some unpleasant conditions to notch a victory over England 2-1. Mario Balotelli put Italy ahead for good in the 50th minute, and England was unable to mount the comeback. The players on both sides were dogged by the hot and heavy conditions. Many of the players in the game were noticeably dragging their feet in the second half of the game, but it was Italy that managed to persevere and notch the valuable victory. As of a result of today's outcomes, Costa Rica and Italy now sit at the top of the group. All eyes will now be on the contest between Uruguay and England on Thursday, as the loser will almost certainly not move through to the knockout round. Will Costa Rica continue to make life difficult against the likes of Italy and England? How will Uruguay rebound once Luis Suarez is re-inserted into their line-up? Can England rebound after today's performance against Italy? 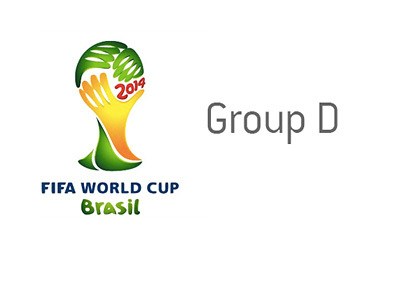 Group D just got very interesting after today's results.